Only a cast iron Dutch Oven can make food like...a Dutch Oven! Camp Chef Classic 10 Inch Dutch Oven is up to the task. 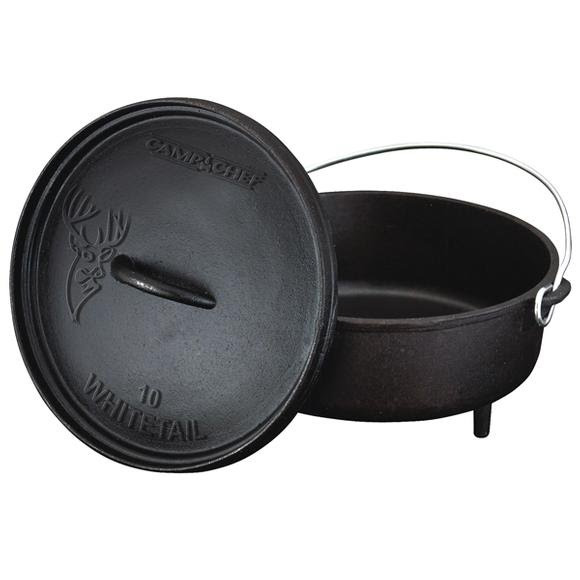 This 4-quart Classic-style 10” Dutch features a beautiful white tail deer etching on the lid, three legs, a handled lid and bale. The raised lip around the lid is excellent for cooking with charcoal briquettes or wood. Seasoned and ready to cook. Only a cast iron Dutch Oven can make food like...a Dutch Oven! Camp Chef Classic 10 Inch Dutch Oven is up to the task. This 4-quart Classic-style 10” Dutch features a beautiful white tail deer etching on the lid, three legs, a handled lid and bale. The raised lip around the lid is excellent for cooking with charcoal briquettes or wood. Seasoned and ready to cook. Each Classic is a modern heirloom cast with Camp Chef&apos;s dedication to quality. Beautiful Whitetail deer print at lid.